S 1/c D. P. Thomson, son of Mr. and Mrs. F. J. Thomson, attended Frederick High School. 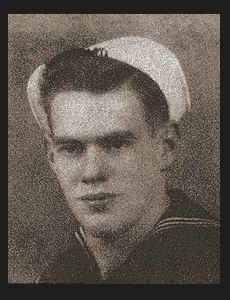 Entered Navy in Nov., 1943, trained in Farragut, Idaho, Great Lakes, Ill., and Ft. Pierce, Fla.; went overseas in June, 1944, served in Africa, Sicily, Italy, France and Yugoslovia; is now on duty in Norfolk, Va. Awarded Good Conduct Medal, ETO Ribbon with one Battle Star, Am. Defense Ribbon.